Activists for conscientious objectors stage a rally demanding alternatives to military service in front of the Constitutional Court in Seoul, South Korea (June 28, 2018). The signs read: " We call for the government to work out alternatives." In a country where all able-bodied men are obliged to serve in the army for up to 24 months, depending on their specific duties, whether to allow people to refuse to join the military due to religious beliefs has been always a controversial topic. In South Korea, most conscientious objectors – usually members of the Jehovah’s Witness Christian denomination — have ended up in jail. However, the mood began to change when Moon Jae-in, who used to work as a human rights lawyer before he joined the political stage, became president. Moon vowed to find an alternative way for them to contribute to the country instead of serving in the military. In the latest example of this shift, the Jeonju local court last month found five conscientious objectors not guilty of violating the Military Service Act. That follows a landmark Supreme Court ruling from November of last year. The top court ruled that religious faith could be a legitimate reason for refusing to join the military when it released guidelines for courts to follow when dealing with cases of objectors. The treatment of conscientious objectors has been often mentioned along with the violation of human rights in South Korea. The latest developments were welcomed by human rights advocates. However, such developments also have created a loophole that can potentially be abused. About 900 objectors, for instance, have postponed their trials, reportedly waiting for more concrete changes to be introduced, which could be favorable to them. Some online users are even sharing tips about how to convert to a new religion and avoid conscription without getting caught. Recognizing the issue, the Supreme Court set up safeguards to prevent abuse. One of them is to check whether objectors have a history of playing first-person shooter games. Since many objectors refuse to join the military in accordance with their religious beliefs that they cannot use firearms, if it is proven that a would-be conscientious objector plays such games often, the credibility of their argument can be indirectly questioned, the Supreme Court argued. Therefore, prosecutors are reportedly checking the access records of some objectors to online game companies that operate first-person shooter games. In doing so, they face criticism for potentially violating public privacy. The government has also taken actions to resolve the issue. The country’s Ministry of Defense announced in December last year that conscientious objectors will be subject to three years of alternative duty at local correctional facilities. Under a new bill, which is expected to be introduced in 2020, objectors who wish not to serve in the military will serve in prisons, detention centers, or other correctional facilities, where they will undertake roles that do not involve the use of firearms or other weapons. Although the ministry stressed that the decision was made based on a set of principles, including achieving fairness for active-duty service members, it immediately drew criticism among civic groups and human rights advocates. The National Human Rights Commission is among the critics. The organization noted that the proposed measures may lack reasonable grounds for deciding details about alternative ways of military service. Choi Young-ae, the chairperson at the watchdog organization, said in a statement that the NHRC has deep concerns that the ministry’s measures do not fully reflect the intent of the Constitutional Court’s decision and international human rights standards. The move comes after constant complaint from the public, with many finding such a term disrespectful to veterans. The defense ministry explained that it decided to replace the term to address concerns that those who have served their duties could be misconstrued as not conscientious. Although the government’s move is aimed to ease social conflict between objectors and those who criticize them, it rather seems to have caused fresh controversies. 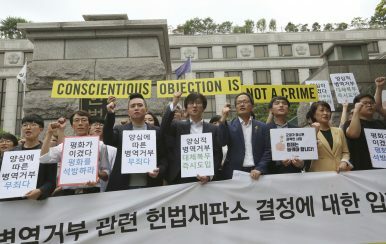 A Seoul-based civic group, the People’s Solidarity for Participatory Democracy, for instance, claimed that the usage of the term “conscientious objectors” is accurate and should continue to be used to protect those who decide to go jail to protect their religious beliefs. “Some non-religious people also refuse to serve in the military based on their consciences. Since 2000, there have been 80 such people,” the group said in a statement. On the surface, the government’s move seems to able to satisfy no one. But it should be also noted that it is the first time the issue has been actively and publicly discussed among different social groups in the country. In other words, this means that South Korea is one step closer to resolving the issue. Younger South Koreans tend to be "national security conservatives," and their social media posts reflect this.